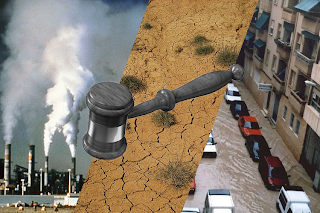 In his article “Apportioning Damages in a Climate Change Tort Suits”, Simon S. Grille presents a new approach to the topic indicated in the title of his article. But before we can value this contribution, we have to explain the context and present it. The principle of joint and common liability according to which each tortfeasor is liable for the entire damage, but may refer to the other tortfeasors to get compensation. The principle of apportionment of damages does not really help the victims of climate change. None of the Greenhouse Gases (GHG) emitting companies is in charge of more than just a few percents (we estimate the biggest polluters to range at about 2 %). Accordingly, victims of climate change, when suing the biggest individual polluters together, cannot expect to get compensation for much more than 5 % of their damage – if the simple principle of apportionment of damages is applied. On the other hand, judges might find it unfair to put the burden for the entire indivisible damage on a polluter who contributed only to 2 % or less to the damage, even if the polluter can then run behind the other polluters to get them pay their share. Provided you follow both points, you are in a justice dilemma: either the victims do not get a substantial compensation or you over-burden those few polluters who happen to be sued. We cannot foresee yet how this theory will be received in the U.S. At any rate, it might have relevance for far more jurisdictions than the one in the U.S. (which the author targets). In all the jurisdictions where joint and common liability is generally rejected or where it is not deemed as appropriate in the case of climate change (e.g. because a minimum contribution threshold has to be passed), a theory of fairness based apportionment of damages could come into play and solve the above mentioned justice dilemma. And maybe there are more reasons why it would be worthwhile investigating this theory. Who knows, maybe the U.S. judges' insistence on questions of standing has also something to do that they feel uncomfortable with the dogmatic questions at the end of the examination chain? This would not be the only case of an avoidance strategy applied by judges.